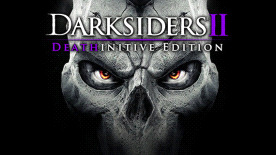 Like the original Darksiders game before it, the second iteration of the series is primarily a hack ‘n slash adventure. The game takes place across netherworld environments, including "The White city," an outpost where angels live, and "The Eternal Throne," a floating fortress where the Lords of the Dead stand guard over souls that need to be cleansed. Although Death is the most feared of the Four Horsemen, his physical abilities are very different than his brother, War. Death is far more nimble, and relies on a combination of melee and ranged attacks. In combat Death's primary weapon is his huge iconic scythe, with a wide range of other weapons and usable items that must be gathered as the game progresses. Weapons can be dual-wielded, upgradable armor can be acquired for protection and Death has access to his terrifying and powerful mount, Despair. © 2013 Nordic Games Licensing AB, Sweden. Developed by Vigil Games. Darksiders, Vigil Games, THQ and their respective logos are trademarks and/or registered trademarks of Nordic Games Licensing AB. All rights reserved. All other trademarks, logos and copyrights are property of their respective owners.